How people-centric, mixed-use and transit-oriented spaces foster a meaningful sense of community. In the 1980s, the city of Boston was nearly synonymous with its NBA team – the Celtics won three championships and reinvented Boston as a destination city thanks to Larry Bird & Co. Ironically, the neighborhood around the old Boston Garden was virtually a dead zone. It was typical for fans to visit the Garden for a game and then leave immediately after for nightlife elsewhere. Boston Garden was the epitome of a single-use building. It offered little to fans beyond the game itself, and certainly nothing outside the actual arena. As a result, the neighborhood and even local economy surrounding the old Garden couldn’t live up to its full prime real estate potential. Many urban areas today that continue to rely heavily on single-use buildings struggle the same way as 1980s Boston. As people live integrated lives, no one is using spaces in a single way. Single-use venues are being replaced with hybrid destinations, multi-use districts and places for 24/7, 365-day interaction. As the annual Design Forecast from the Gensler Research Institute found, mixed-use environments – structures or communities blending residential, commercial, cultural or entertainment uses – unlock the possibilities of a diverse, urban lifestyle and breathe new life into cities. Boston is just one example of this trend in action. 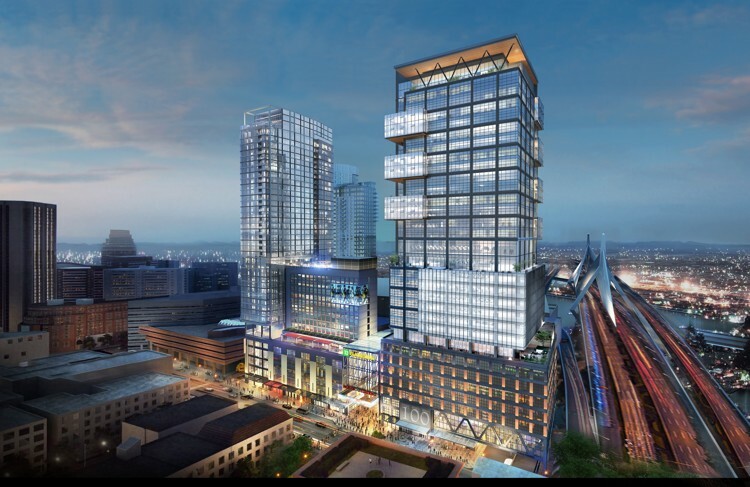 When the city began rethinking the area around the new TD Garden the Celtics now call home, they knew they needed a mixed-use development to revitalize the area. Gensler, the global architecture and design firm commissioned for this project, approached the design of The Hub on Causeway to be a two million square-foot mixed-use development blending many activities, creating a new home for retailers, offices, residents and hotel guests. The main view of the Hub in Boston. Photo by Gensler. A critical component is the project’s streetscape design, which broadens the neighborhood while establishing a new shopping experience along Causeway Street. At its heart is a five-story arcade, covered by a steel-and-glass canopy, and lined with restaurants, markets and shops. Urban reclamation projects are popping up all over the United States, where mixed-use developments are redefining entire neighborhoods. Riverwalk Place, Tampa. Photo by Gensler. Recent examples include the massive 52-story Riverwalk Place in Tampa, and Cincinnati’s Over-the-Rhine neighborhood rebirth, which, in turn has also started a shift toward developers and architecture firms becoming more like cultural curators. At the heart of what they’re trying to do is create an experience for the community. The Atlanta suburb of Alpharetta, Ga., just underwent a multi-million dollar, mixed-use development called Avalon. Avalon spans 86 acres and includes 500,000 square feet of retail space, a movie theatre, a hotel, single family residences, luxury rental homes, a dog park and more. Like many reimagined urban spaces, Avalon aspires to be a “third space,” a place to convene between work and home. By design, the events in Avalon’s public spaces are built to draw crowds. This trend toward mixed-use success isn’t just limited to the U.S. Another very different project is generating similar results in Shanghai. Reimagining Shanghai’s Changning district. Photo by Gensler. The business development across China in the past decades has been unrivaled and has changed the face of the country. But it has been largely done without great consideration for whatever else was going on, or could go on, in and around those massive developments. 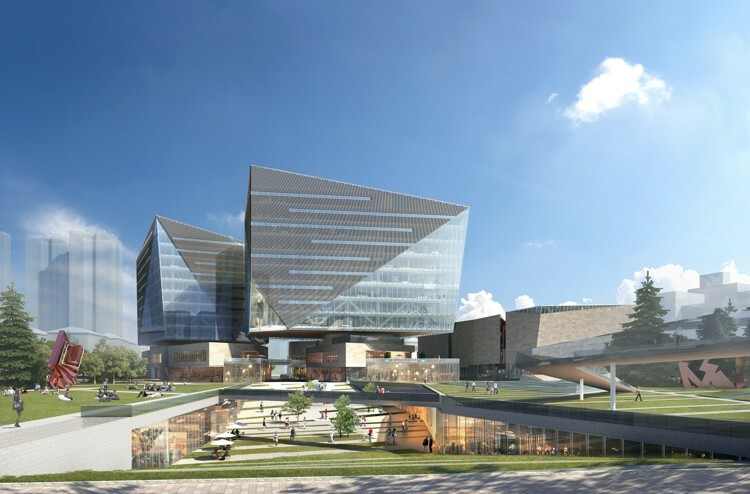 In Shanghai’s Changning district, Gensler designed a mixed-use development tailored to the neighborhood’s growing reputation for fashion, arts and culture. That project was originally driven by a plan for two new office buildings, but went beyond that to create a hybrid, mixed-use district. Taking design cues from the adjacent Liuhaisu Museum, the buildings were made from similar stone, glass and metal, reinforcing the relationship with the existing museum. The buildings were then raised above an area for retail and includes a sunken plaza, with easy access to nearby Tianshan Park, subways and walkways. 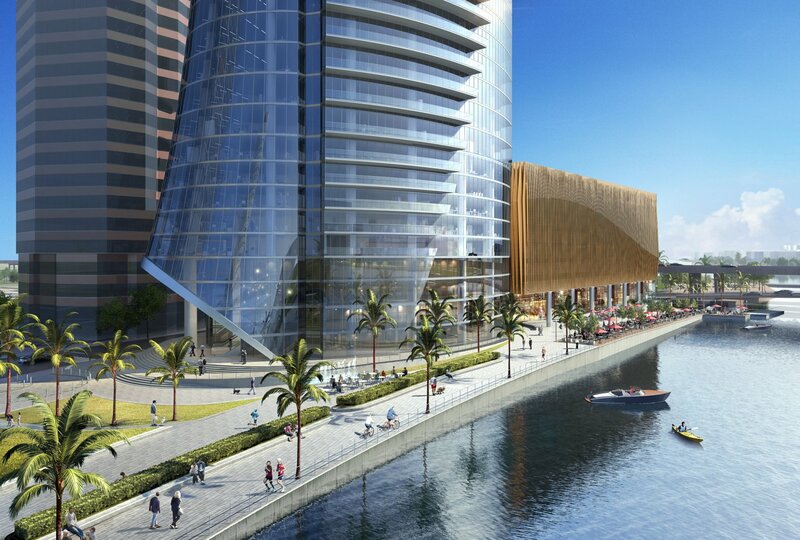 These types of mixed-use developments focus on how the spaces can connect the community and create a sense of place that is desired in the modern, human-centric city. The sunken plaza nearby Tianshan Park. Photo by Gensler. “In doing so, we created a authentic destination containing boutiques, artists’ studios and exhibition space,” says Shamim Ahmadzadegan, a global leader in Gensler’s mixed-use practice area, in an upcoming edition of Dialogue, the firm’s publication on prevailing issues. Critical to the success of almost every mixed-use project has been the inclusion of retail space. In 2017, a record 9,000 U.S. retail stores shut down, according to Cushman & Wakefield. And while the recent travails of retailers – and especially retail malls – has been covered extensively in the past few years, retailers are starting to accept that adopting a mixed-use mentality will be a key for future success. Their willingness to change and accept new things is a matter of survival. Fifth + Broadway in Nashville. Photo by Gensler. Fifth + Broadway, a new mixed-use development at the site of the old Nashville Convention Center, is one example. 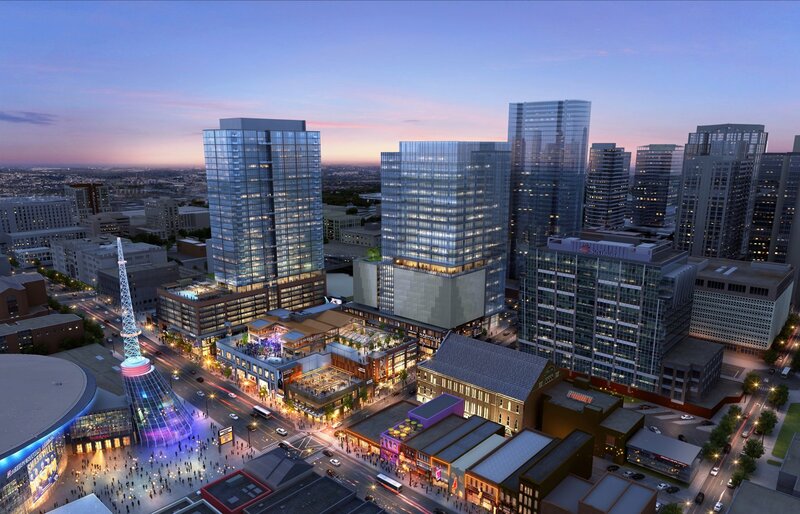 Developers knew that to ensure retail success, they had to create a vibrant experience to entice tourists away from the iconic Broadway strip to downtown Nashville. 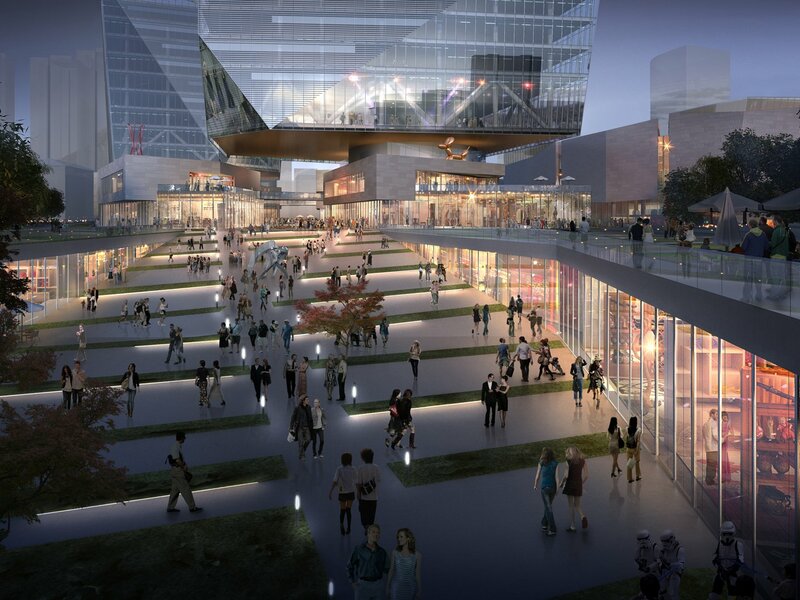 Fifth + Broadway integrates with the urban fabric of Music City by mixing retail and restaurants, a rooftop events space, a market hall, live music venue and more – successfully drawing visitors to the new Nashville focal point. And while the retail disruption isn’t over, successful brands have evolved, recognizing that customers expect a seamless experience across all touchpoints, explains Lara Marrero, a global leader in Gensler’s retail practice. And physical stores, which emphasize engagement over transaction, are a key part of that equation. According to IHL Group, for every company closing a store, 2.7 companies are opening one. “While retail as we once knew it may no longer be the same, the industry is as vital as it’s ever been,” Marrero says. To thrive, retail spaces and other developments must design for engagement—not just by mixing uses through a blend of different space types, but also by looking at how a place changes from day to night, so it’s activated for different audiences. So whether in Boston, Shanghai or any other major market, the most successful developments will be people-centric, mixed-use and transit-oriented to foster a meaningful sense of community.